Edwin Jacob “Jake” Garn is a former senator, mayor, general, astronaut, naval pilot, and businessman. He is a member of The Church of Jesus Christ of Latter-day Saints. He shared his testimony in a book he published in 1992, Why I Believe. He was selected as part of the Space Shuttle Discovery crew in 1985. He traveled into space as a payload specialist and congressional observer on one journey that encompassed 108 orbits around Earth and over 167 hours in space. He asked to fly on the Shuttle because he was head of the Senate appropriations subcommittee that dealt with NASA. He experienced extreme space sickness and was the subject for medical experiments for the sickness. NASA’s Jake Garn Mission Simulator and Training Facility is named for him. In 1989, he co-authored a novel, Night Launch, in which the Space Shuttle Discovery features prominently in the plot. Garn was born on October 12, 1932, in Richfield, Utah. 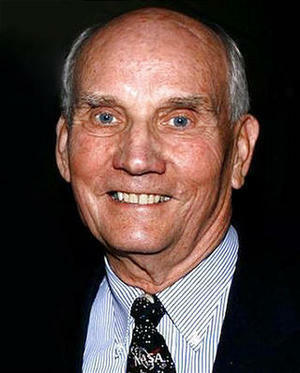 He earned a bachelor’s degree from the University of Utah in 1955 and continued graduate work there for another year. From 1956 to 1960, he was a pilot in the U.S. Navy. He began an insurance business in 1961 and served in the Utah Air National Guard from 1963 to 1979. He retired as Brigadier General. He began public service in 1968 when he was elected as a Salt Lake City commissioner. He served until 1971, at which time he was elected mayor of Salt Lake. While in office, he served in the Utah League of Cities and Towns and served as president in 1972. In 1974, he was appointed the first vice president of the National League of Cities. In November 1974, he was elected to the United States Senate. Incumbent Wallace Bennett resigned on December 20 so that Garn could take office early and gain seniority. Garn was reelected twice (1980, 1986) but did not seek reelection in 1992. In a 2006 interview, he said that he retired from the Senate after his third term primarily for his family. He said that when his youngest daughter was three, a picture of the Capitol came on television and she said, “Daddy, that’s where you live.” He replied, “No, that’s where I work.” She insisted, “No, you live there.” He does not miss the many late nights and heavy schedule and enjoys spending time with his family. Garn married Hazel Rhae Thompson in 1957. They had four children. She was killed in a car accident in 1976. Garn married Kathleen Brewerton in 1977. They had two children, and he is step-father to her son from her previous marriage. In 1986, Garn donated one of his kidneys to one of his daughters who was suffering from kidney failure brought on by diabetes. In February 1980, Garn was honored by Freedoms Foundation of Valley Forge, Pennsylvania, along with actor James Stewart, singer John Denver, U.S. Ambassador Shirley Temple Black, and businessman Tom Abraham (who helped immigrants become U.S. citizens). This page was last edited on 24 November 2014, at 14:54.